This was a warm day for this particular Summer. A breeze and some showers moved across the Scottish Borders and I decided to go for an exploration. Leaving the town I headed towards Hawick and took the small road down to the Ettrick Valley. There is a short cut that runs steeply down a rough stoney lane and after the recent heavy rains, the last section was flooded with over a foot of water. Not a problem for the Raven Tour. Crossing the road and through a farm yard lead to a short grassy path to a footbridge over the River Ettrick. The path re-emerged on a small road leading past Bowhill Estate and taking the old single track road I finally arrived a few kilometres later at Yarrowford. The rain was now heavy but it was warm. I had intended to head up the valley to St Mary’s Loch but saw a small sign to Innerleithen via Minch Moor. I thought I would have a look. Soon the road turned to a good track, then to a path, and finally a sheep track. It was of course sign posted for walkers, not cyclists. 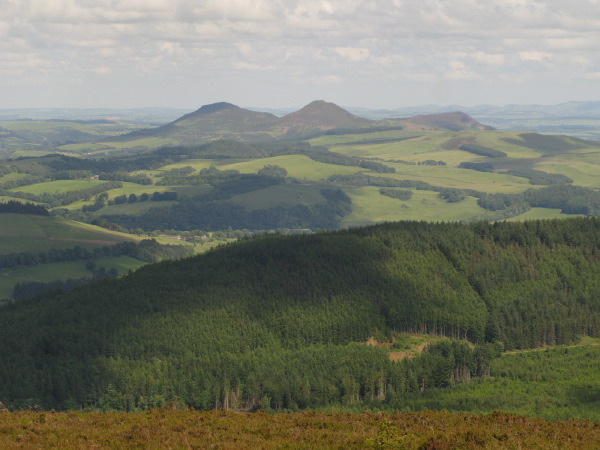 I passed a group of walkers who looked at me strangely as they had just completed the path from the Tweed Valley. They never expected to see a cyclist on a walking path! The path led up a small valley and looked very steep at the top. I would have a look. I could cycle some of it and the 38 chain ring coupled with the rear 16 tooth cog of the Rohloff was pretty effective even on some steep sections. Soon however, I had to walk the bike, then push up the last fairly steep 50m climb to the Southern Upland Way path that let along the top of Minch Moor. I knew the route having walked it a few years ago so headed East towards the Three Brethren. The track was rutted, and flooded in parts but some sections were pretty smooth. The Raven’s sturdy steel frame made for a comfortable ride. The Magura Odur suspension forks did their job. I was thinking of a new seat suspension tube to ease that end of things! At the top a stiff breeze was blowing. There was no one. No mountain bikers, no walkers, just me and Torla my trusty Thorn Raven Tour. A brief rest and it was all down hill now! The numerous sheep did not hear me approach and they ran startled as I got nearer. The track down was heavily pitted with water filled holes and brick sized rocks. I found that the Magura Odur suspension fork was stable, very controllable, and very sure-footed on this rough terrain. I would not use it on a road tour but for all off-road terrain like this it is ideal. There is a dynamic lock-out function which would be useful on a mixed on and off-road tour. Eventually I arrived back at the main road. Somewhat relieved but not looking forward to the climb back to the top of the town, I continued a smooth grind up hill to home. The distance was not great, and it was only a ride of just over 3 hours, but I was exhausted. The dark storm clouds had arrived, I just made it back as the heavens opened. I hosed down Torla and had an early night. 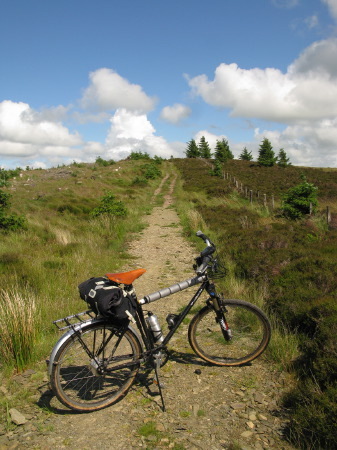 This entry was posted in Day Trips, Scotland, Tours and tagged local rides, Magura Odur, map, off-road, preparation, Selkirk on June 30, 2012 by Richard.